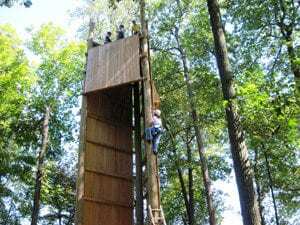 Ziplines in Lancaster County, PA at Black Rock Retreat - Go Zip Lining in Lancaster, PA! Go ziplining on Black Rock Retreat’s 400-ft zipline in Lancaster, PA begins at the top of our 33-ft tall tower. Participants climb to the top and a facilitator will connect them to the zipline cable to begin their ride. Our zipline reaches speeds up to 25 mph for an average-size participant. Cost: $175 per hour or included with our High Ropes Program. This standalone activity is only available to overnight guests of Black Rock Retreat.